Impressive mountains and volcanoes, lush green forest, pretty rice paddies, tropical beaches and a stunning blue ocean make it the perfect island getaway! 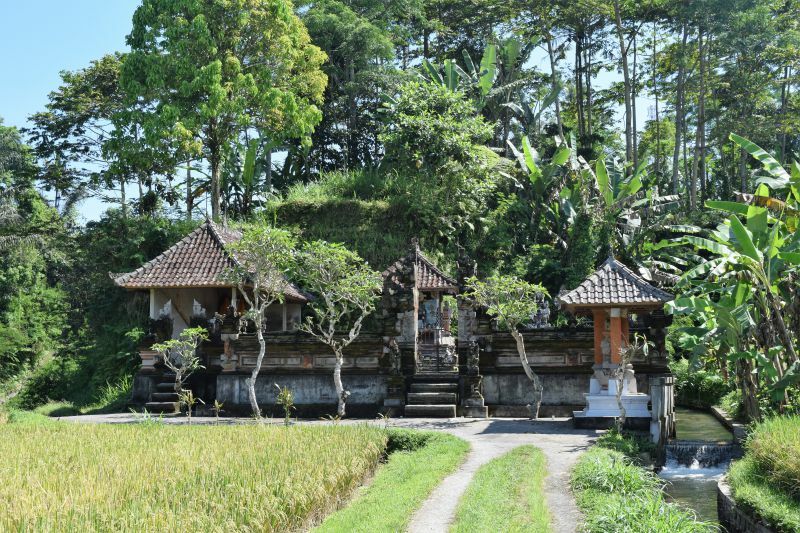 More than 80% of the population adheres to Balinese Hinduism, which results in a multitude of temples, colorful offerings on every street and a friendly atmosphere. As this was our first time to Bali, we aimed for a balance between sightseeing and relaxing. 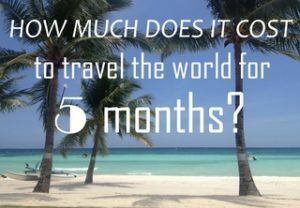 I think we managed pretty well, particularly because I always try to cram way too much into our itinerary;-). So how did we spend our 2 weeks in Bali? Bali is quite big and traveling doesn’t go very fast because of the busy roads, so obviously we did not nearly see everything! Nevertheless, we visited 5 very different places on Bali: Sanur, Nusa Lembongan and Nusa Penida, Sebatu, Canggu and Jimbaran. Bali must-sees and highlights in the places we visited (Sanur, Nusa Lembongan and Nusa Penida, Sebatu, Canggu and Jimbaran). 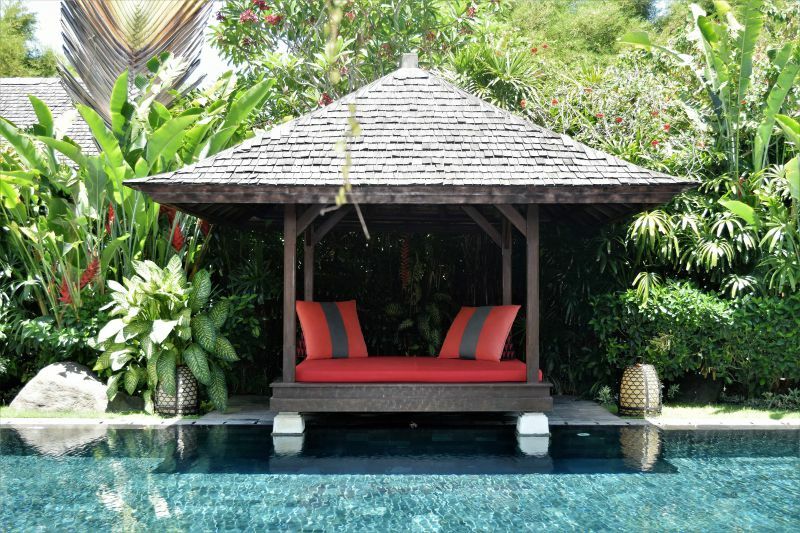 Where to stay on Bali? How to get around on Bali? 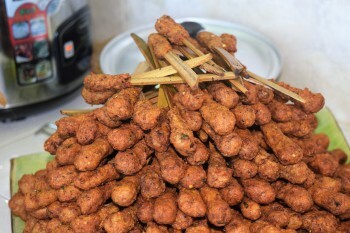 I’ve market all the highlights we visited during our time on Bali on the map below. I considered adding a couple of my favorite places to eat, but there are so many warungs where you can get delicious local food, it won’t be hard to find your own favorites! You’ll also find the names and locations of the accommodation we stayed at. At the end of the post you can download this map as a (printable) pdf. Okay, honestly… we didn’t do that much in Sanur. We were jet legged from our (long) red-eye flight from Canada and spend most of our time relaxing. 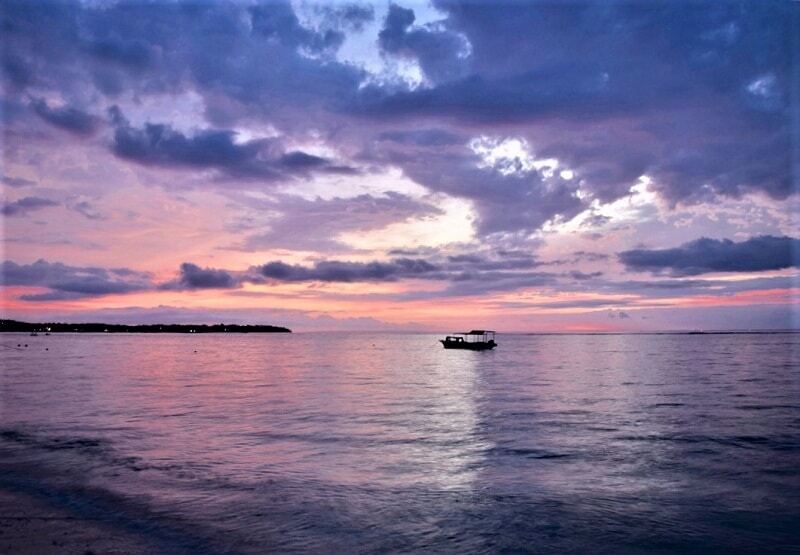 For which Sanur is the perfect place! 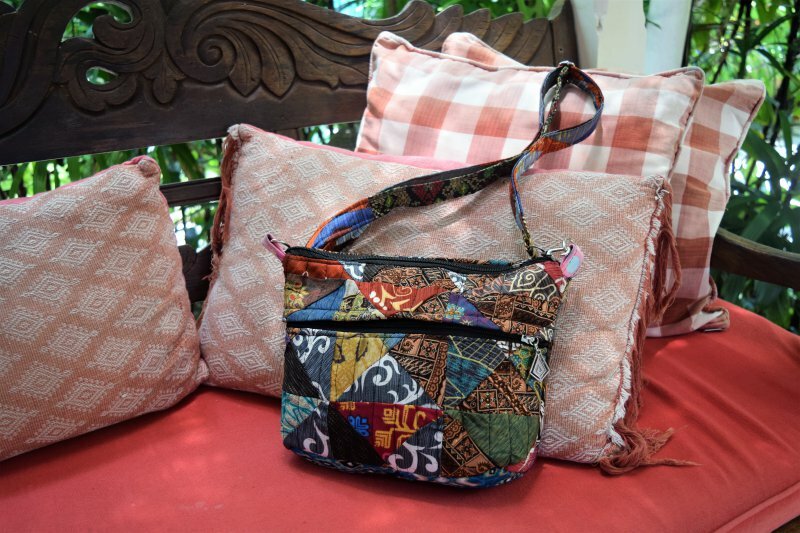 It’s not nearly as frantic as Ubud or Kuta, but you’ll find everything you need and more. The relaxed pace was one of the reasons we picked Sanur as our first destination on Bali. 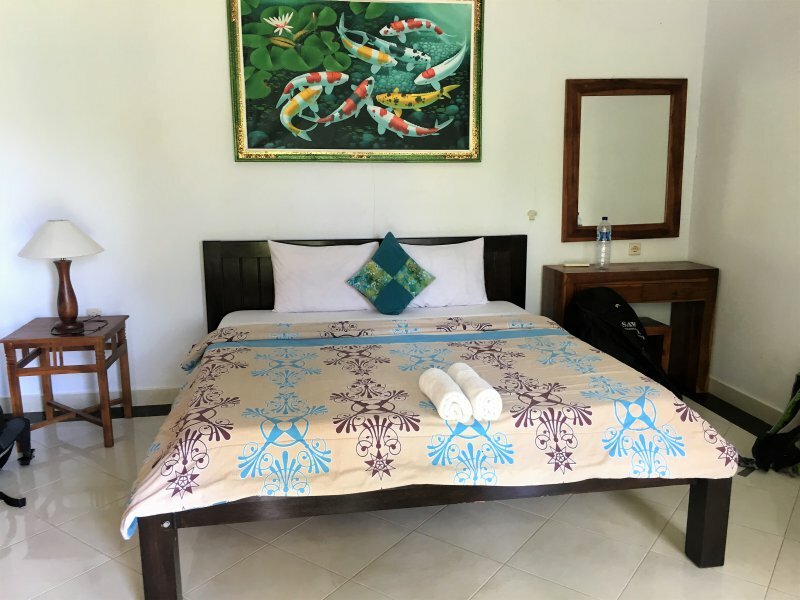 Other reasons were its proximity to the airport (only 30 minutes by taxi) and because Sanur is the gateway to the beautiful islands Lembongan and Penida (nusa means island). That being said, there are some things to see and do in Sanur! There is a nice beach and while it may not the prettiest beach on Bali, you do have a beautiful view over Mount Agung. And if you not hungover from your jetleg like us and drag yourself out of bed early, you can catch a sunrise! There are several temples, lots of restaurants and small shops. I bought a very cute Balinese bag to replace the one I got in Vietnam 3 years ago (which was falling apart). 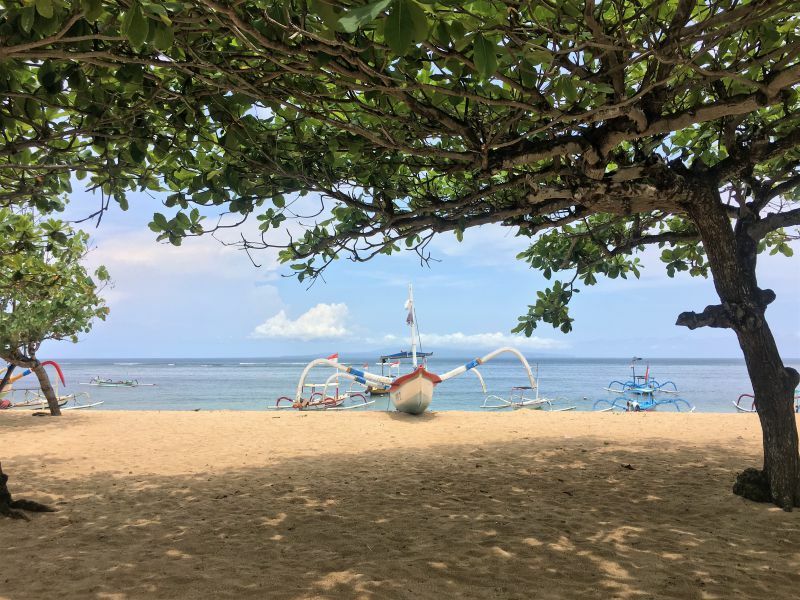 Bottom line: Sanur is a great place to start your Bali trip! Wisna House was the perfect place to stay after our flight, because it was very quiet and relaxed. It’s a small family run ‘hotel’, there are only 3 rooms overlooking a cute courtyard. The rooms are brand new and nicely decorated (we stayed in room 2). The bed is super comfortable and WiFi was fast for Balinese standards. New and clean bathroom with rain shower. There was a little porch in front of the room where the friendly owner served our breakfast (included) in the morning. 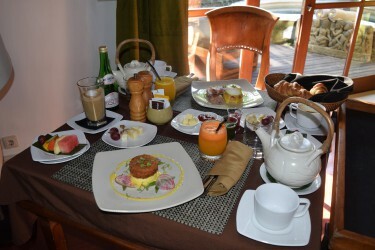 We especially loved the Balinese breakfast! Altogether we had a great stay and I would definitely book Wisna House again. Sanur is one of the cheapest places to get to from the airport. How much you pay depends on your bargaining skills. Uber, Grab and Go-Jek are not allowed onto the airport but there are airport taxis. These taxis are more expensive, but offer a fixed fee and no hassle (price is 250.000 rupiah to Sanur). After a bit of bargaining we managed to get a taxi to Sanur for 150.000, the ride took about 30 minutes. 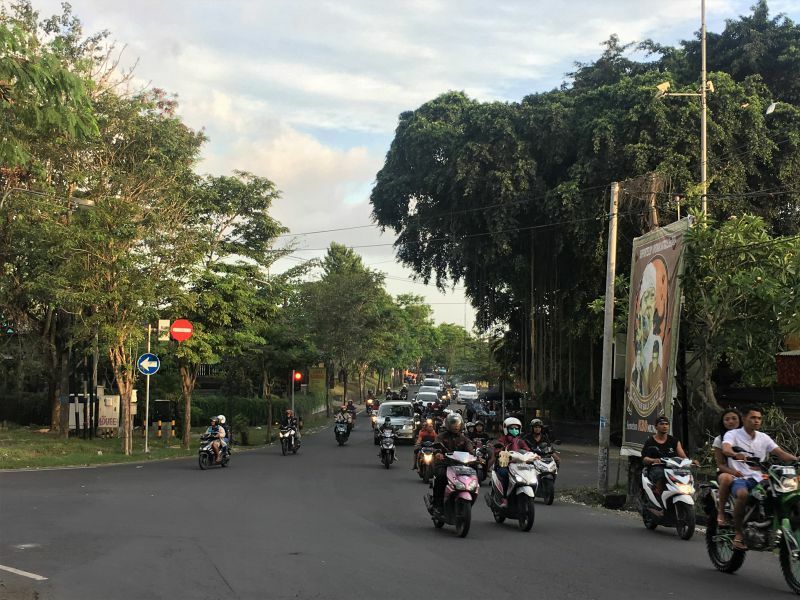 Traffic is busy on Bali so even though distances may be small, it often takes a long time to get to your destination. I loved Nusa Lembongan and Nusa Penida! These islands are the epitome of a tropical paradise and are less busy than Bali. Since getting my PADI in the Philippines in 2015, I’m hooked on scuba diving! So whenever we are in a country with good dive opportunities there is no stopping us! There are many dive schools on Lembongan, all offering dive trips to Nusa Penida where you can see Manta Rays! If you are lucky that is, obviously manta rays are majestic wild animals who go wherever they please. 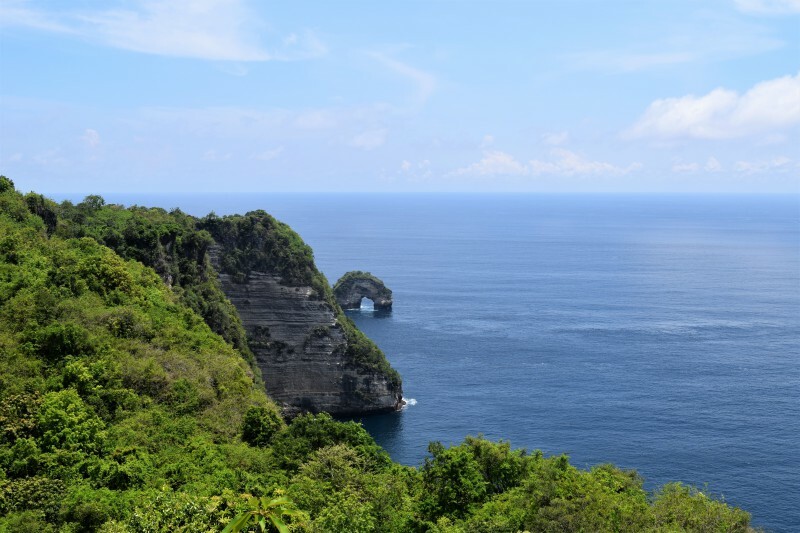 But because the waters around Nusa Penida are full of plankton and jelly fish, manta rays can be seen feeding in these waters year round. It was a truly magical and humbling experience to swim below (and above) these giants! The mantas are so graceful and fly effortlessly through the water. Note: prices are similar at most dive school on Lembongan, expect to pay around 1 million rupiah for 2 dives as a certified diver. This usually included equipment, lunch, drinks, transport to the dive sites and guidance by a certified dive master. 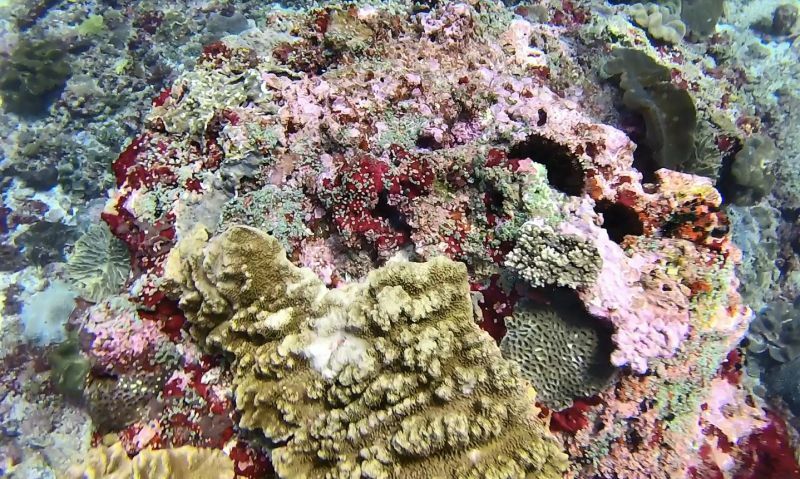 An additional 100.000-150.000 rupiah is added by all dive schools for Manta Point (because it’s quite far). Nusa Penida is absolutely breathtaking! We took a small boat from Lembongan to Nusa Penida in the morning, rented a scooter at Toyapakeh and drove around the island the entire day. We visited Broken Beach, Angel’s Billabong, Kelingking Beach, Pura Paluang, Bana Cliff, Tembeling Forest and Pura Puncak Mundi. Practical information: the boat from the Yellow Brige on Lembongan to Toyapakeh costs 50.000 rupiah per person. There is no fixed schedule, boats leave when there are enough people. It only takes around 15 minutes to get across. The moment you step foot on the beach at Toyapakeh people will ask you if you need a scooter. We rented one for 70.000 rupiah, including a full tank of petrol. 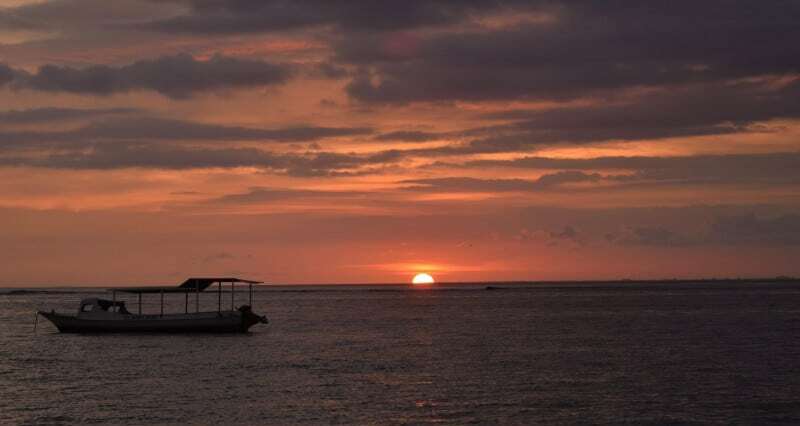 On Nusa Lembongan you can see both the sunrise as well as the sunset! I’m usually too lazy to get up for sunrise, but we got a beautiful sunset in the evening. Just find a nice little restaurant on the beach and enjoy! 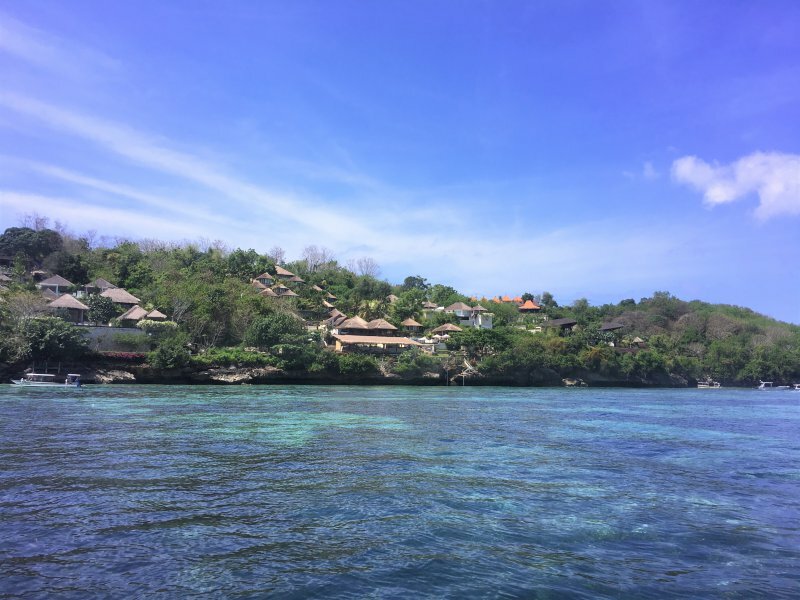 Important note: we stayed on Nusa Lembongan for 3 days (2 nights). In hindsight it would have been better to stay another night. In fact, if I could do it again I would store my big luggage on Nusa Lembongan for a day and spend two days (and one night) on Nusa Penida! That would have given us time to visit the East (Atuh Beach) and North side of the island as well. We stayed 2 nights at the Shipwreck Point Inn, a very nice place. There are several villas overlooking the lovely garden. Spacious room with a comfortable bed. Large bathroom with hot water (which you don’t really need it because it’s so hot outside). Air conditioning and free WiFi (not very stable or fast, but worked most of the time). The owner is very accommodating and helped us rent a scooter. He also gave good advice about the boat to Nusa Penida. I would have loved to stay longer! The Sri Rejeki boat was in good condition and the crew handled our luggage with care. The boat departed only 15 minutes late, which for Asia is exactly on time;-). But seriously, we’ve had much longer delays, 15 minutes is very very good! On Nusa Lembongan we were brought to our hotel by the Sri Rejeki tuktuk and on the day of our departure we were picked up from the hotel as well (included in the ticket price). Altogether it was a smooth boat transfer! Our time in Sebatu was very special because we spent three days living with a local family. 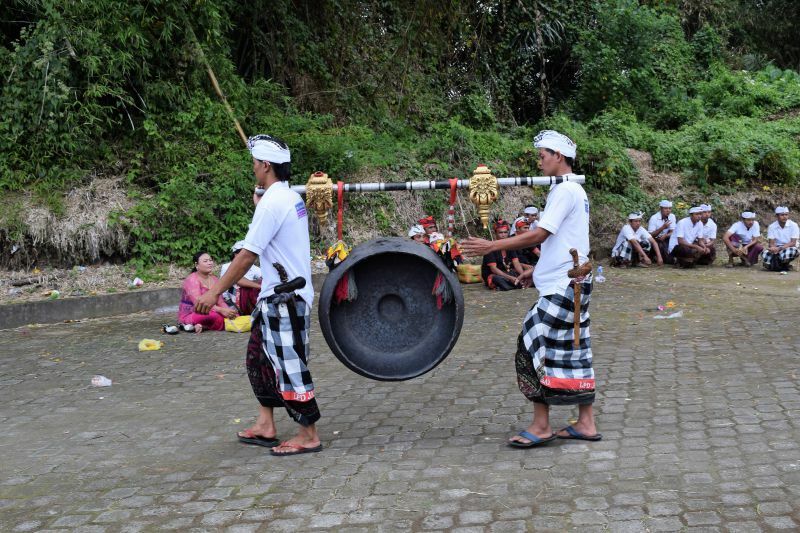 This concept by Duara Travels brings tourists and Balinese people together. 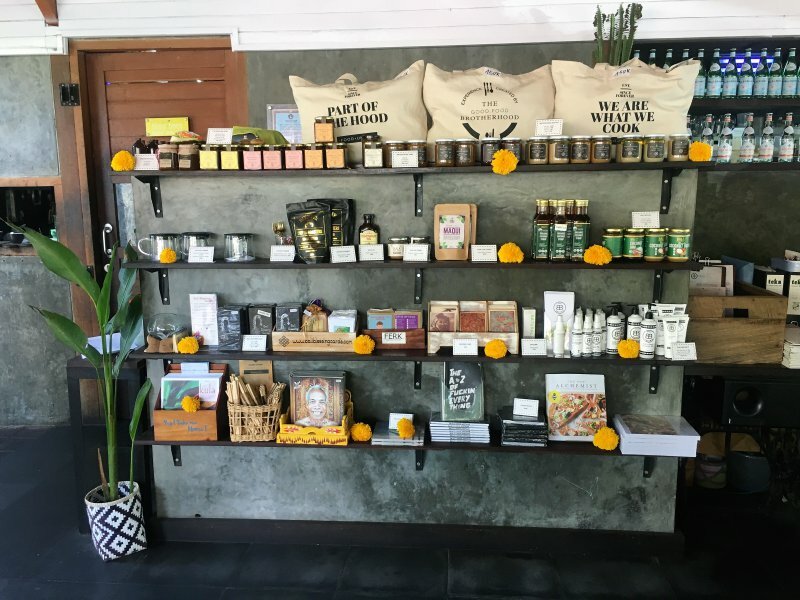 It gives travelers a unique insight into Balinese culture and life, while simultaneously generating an extra income for the host family and the village as a whole. You can read more about the Duara concept on the Duara Travels website! We loved this different side of Bali! Sebatu is only 16 kilometers away from Ubud, but we didn’t seen any other tourists during our stay. 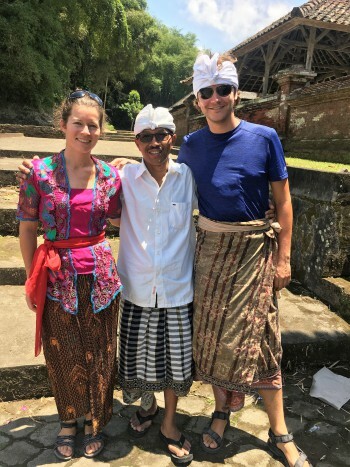 Together with our kind host Wayan we explored the rice fields and went to a ceremony at the village temple. Wayan’s nephew Agus taught us about Balinese history, culture, traditions and the tightly knit communities, called banjar, which are the cornerstone of Balinese society. 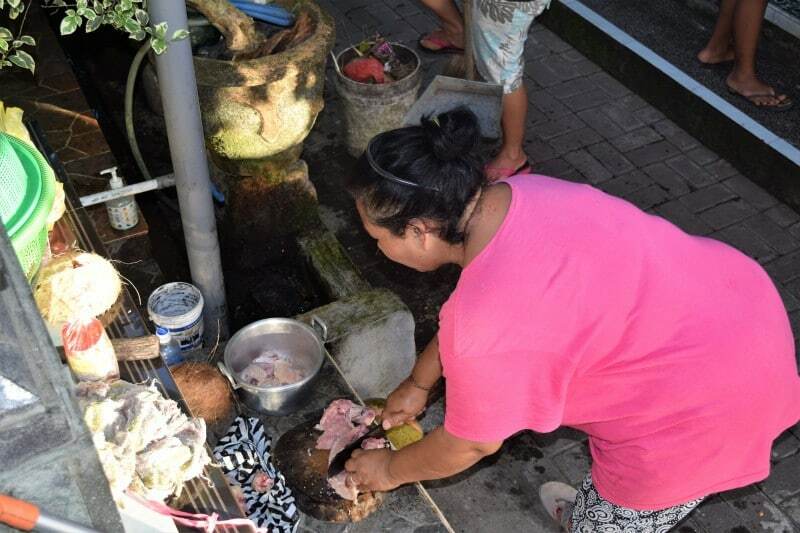 We ate delicious home cooked meals together with our host family and even got to help a little by preparing sate for Galungan Day, a very important Balinese religious day. Altogether it was a very special experience and something I would love to do again! Read more about our stay with Wayan and his family. During our stay, our host Wayan was so kind to lend us a scooter so we could explore the area around Sebatu and Ubud. There were so many beautiful green rice paddies! It didn’t really matter which direction we choose, rice paddies everywhere! 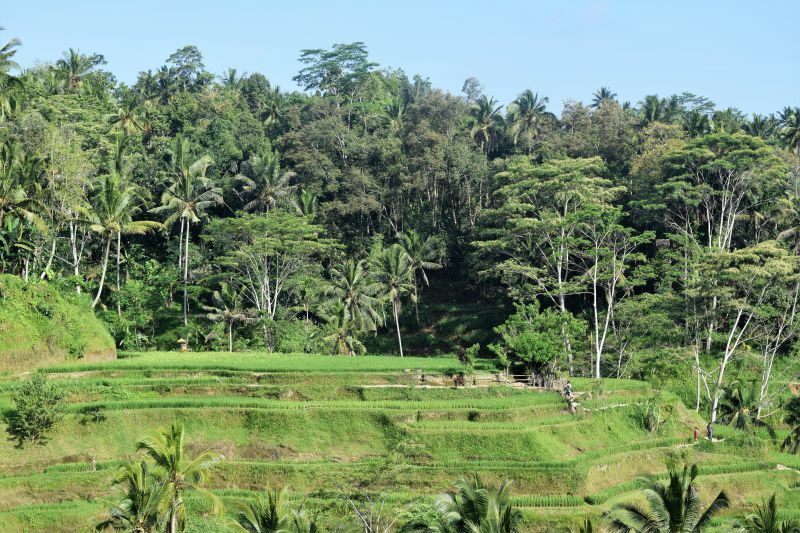 The rice terraces at Tegallalang are quite famous and I have to admit they are beautiful. Not as spectacular as the rice terraces of Batad in the Philippines, but still very pretty and green! Conclusion: it doesn’t matter where you go, just hop on a motorbike and explore the surroundings of Sebatu, it’s beautiful! Volcanoes are always impressive and so is Mount Batur. Standing 1717 meters tall it may only be a small mountain compared to it’s big brother Mount Agung (3031 meters), but Mount Batur is beautiful nonetheless! 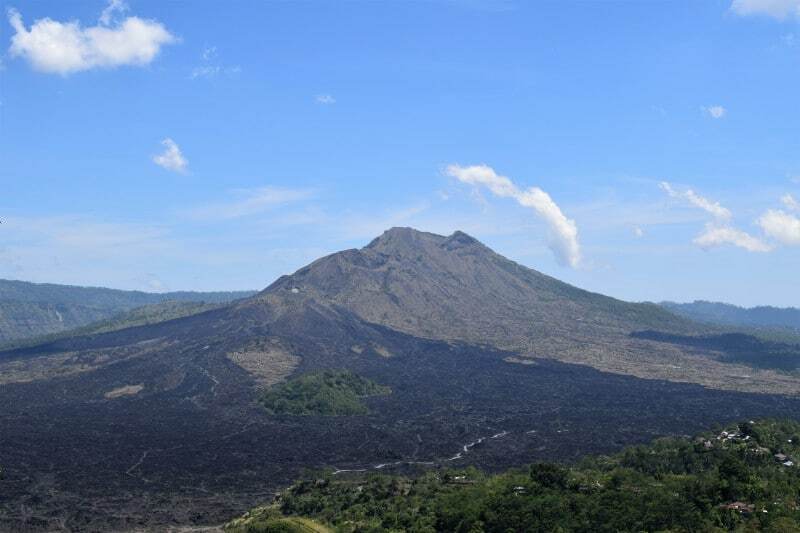 Note: Mount Batur is located approximately 18 km from Sebatu (and 34 from Ubud). There is a 30.000 rupiah entrance fee per person, plus 3000 for a scooter. In case you didn’t know: Bali is hot! Imagine how good it feels to cool off at a nice fresh waterfall… During our scooter road trip we checked out the Kanto Lampo Waterfall (entry by donation) and the Tibumana Waterfall (10.000 rupiah per person). Both can easily be reached from Sebatu (26km) and Ubud (10km). 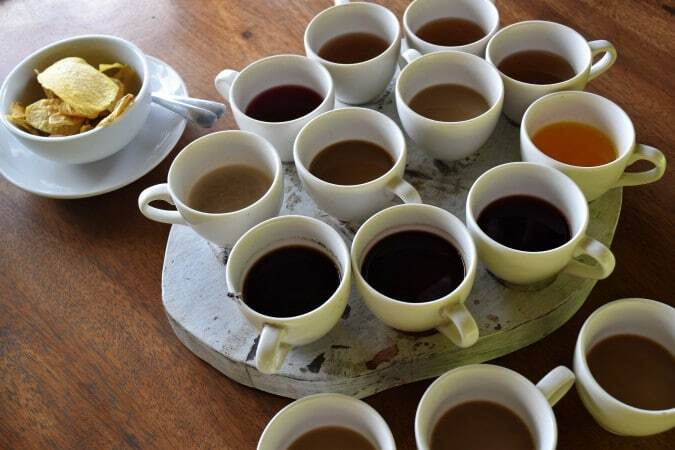 Have you heard of the famous Luwak coffee? This special coffee is also called civet coffee and is made from partly digested coffee cherries eaten and pooped out by the Asian palm civet. Yes, coffee made from poo, and it’s hugely popular too! 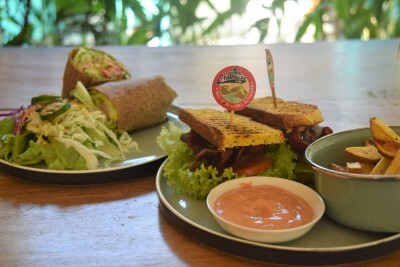 We did a tasting at Basanta Agro Organic, located a couple kilometers from our home-stay. While it was fun to try this hyped coffee, I actually preferred the (free) coconut coffee and (free) ginger tea over the exclusive Luwak (50.000 rupiah per cup). As mentioned above we stayed with Wayan’s family via Duara Travels. You can read more about this specific village here. 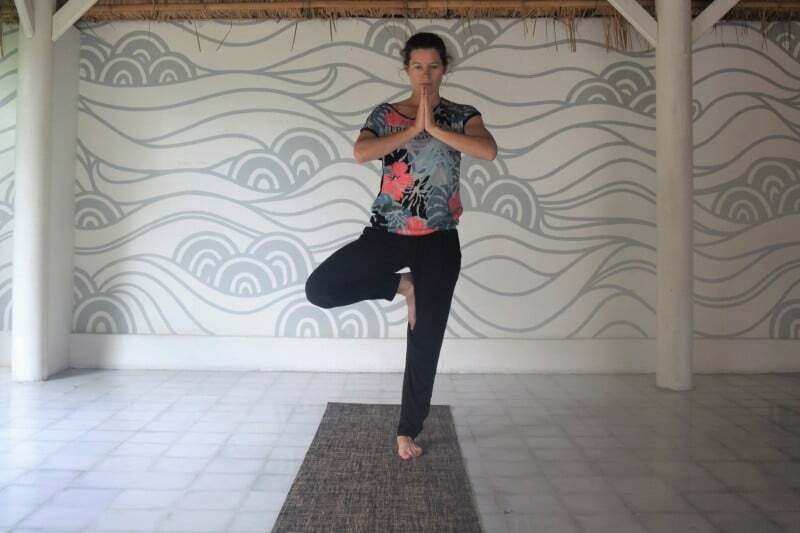 I highly recommend this experience, it was one of the highlights of our Bali trip! You can easily get transport from Sanur to Sebatu via Uber, Go-Jek and Grab, but we were very lucky our host Wayan had time to pick us up! Not only did we have more time to get to know each other, it also provided the family with a little extra income (we paid 220.ooo rupiah for the transfer). Depending on the traffic traveling from Sanur to Sebatu will take between 90-120 minutes. If you have an extra day: Explore more places in and around Ubud or hike to the top of Mount Batur! Canggu is famous for surfing, unfortunately I only surfed once in my life (an introduction lesson in Sri Lanka) and the impressive waves were too high for me… It looked very spectacular though from the beach! Yes, this temple is very touristy but it is build on an amazing location… The entrance fee is a little steep for Bali (60.000 rupiah per person, plus 2000 parking for a scooter) but the views are beautiful! After 9 months of travel it was time to replace some clothes (Frank’s shirts were threadbare and I’m always wearing the same clothes in all our pictures;-). Lucky for us there are lots of cute shops and boutiques in Canggu. We bought a couple of new T-shirts for Frank and I found a gorgeous long black dress for myself! 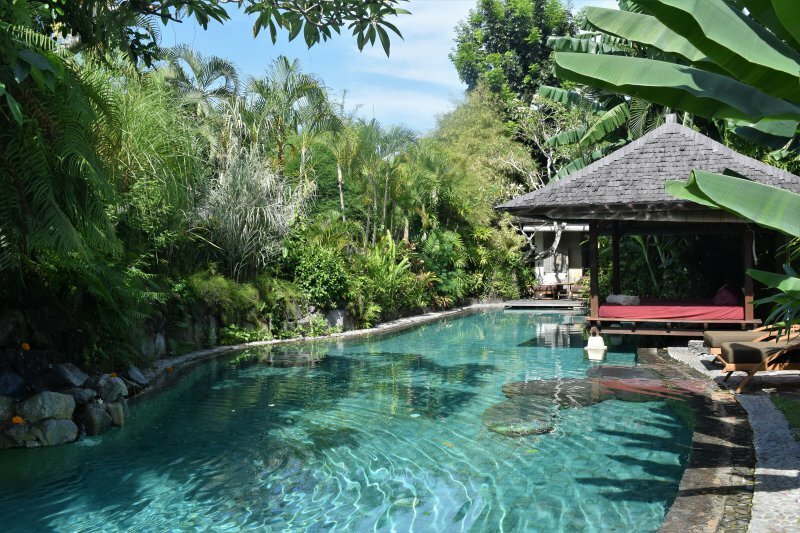 We stayed at the Chillhouse in a lovely garden bungalow called Indah, which means beautiful in Balinese. Our cute villa had a comfortable king-size bed, a mosquito net, an outdoor shower and an awesome bamboo chair in the garden. 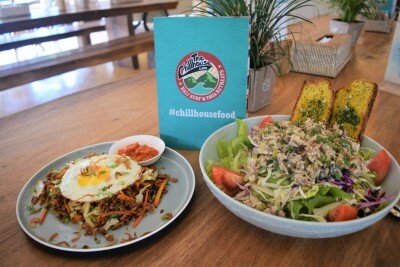 The atmosphere was super chill (what’s in the name), the staff relaxed and friendly and the food… oh the food was so good! Breakfast and dinner were included, but we also had lunch here every day, there were so many items on the menu we wanted to try! To compensate for eating all the time, I joined a relaxing yoga class and went for a dip in the pool (there are 2 swimming pools, the one in the back is bigger and more quiet). I also spent a lot of time in the co-work space to catch up on the blog. WiFi was good in the work space, but not always in our room (a problem for Bali in general). Altogether we had a very relaxing stay at the Chillhouse! We were lucky again that Wayan had time to drive us! I’m not sure how easy it is to get an Uber/Go-Jek/Grab from Sebatu, but since it’s not far from Ubud it should be possible. We paid 400.ooo rupiah for our transfer, it took around 2 hours to get from Sebatu to Canggu. Unfortunately Uber, Go-Jek and Grab are not allowed in Cangu (only for drop-off, not pick-up). There is only one taxi company allowed to operate so expect to pay a lot more for your transport to Jimbaran (between 200.000 and 300.000). 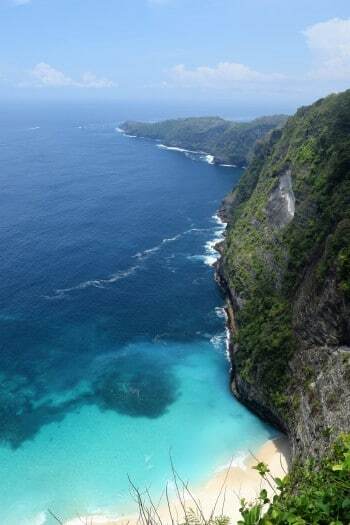 Also read which other islands to visit in Southeast Asia! 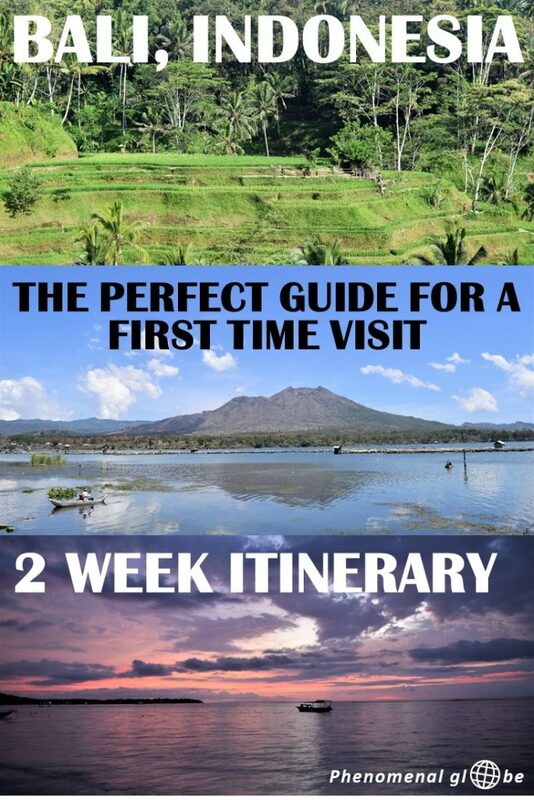 That’s our 2 week Bali itinerary! 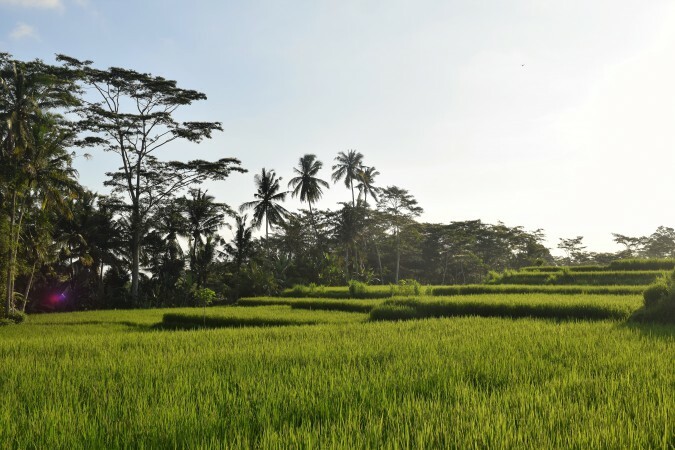 I would have loved to spend more time on this laid-back and beautiful island… You can download a map with this Bali itinerary below. 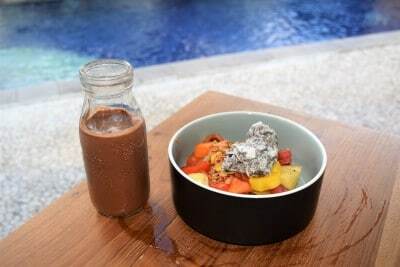 Disclosure: I was hosted by Duara Travels in Sebatu, the Chillhouse in Canggu and Jamahal Private Resort and Spa in Jimbaran. Nevertheless, all pictures and opinions are my own. Hi there! 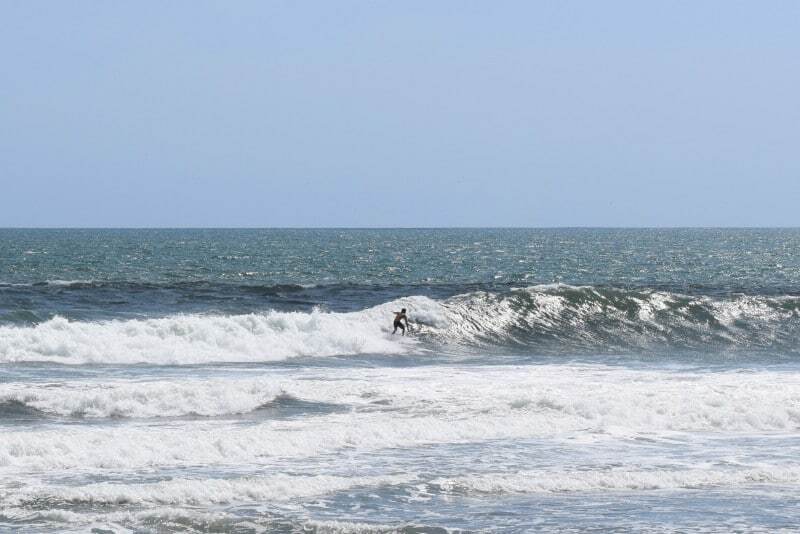 Next time you go to Bali, try to check out Seminyak and Legian – perfect locations for a beginner surf lesson! Thanks for the advice, I will! 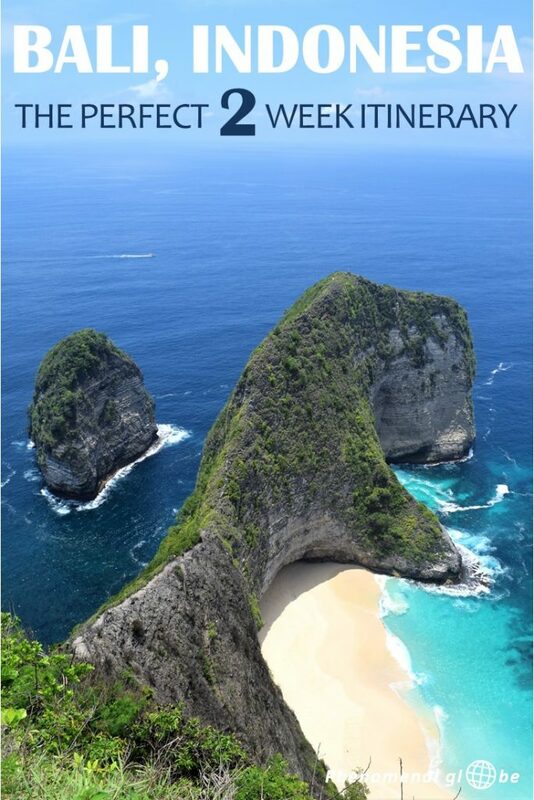 Hi Lotte, it’s nice info and I hope you may enjoy another travel destination in Indonesia. Anyway, our currency is Rupiah/IDR not Rupee. I hope so too, there is so much more to see and do in your beautiful country:-). Thanks, I have corrected the name of the currency in the post! Hey great itinerary, I fly to Bali for the first time in 3 weeks, then making my way around South East Asia. Thanks for sharing your trip, next time I’ll be sure to visit Gili Air. I have a Nikon D3300 and I’m very happy with the quality of the pictures:-). Happy travels! Thanks so much for your sharing. 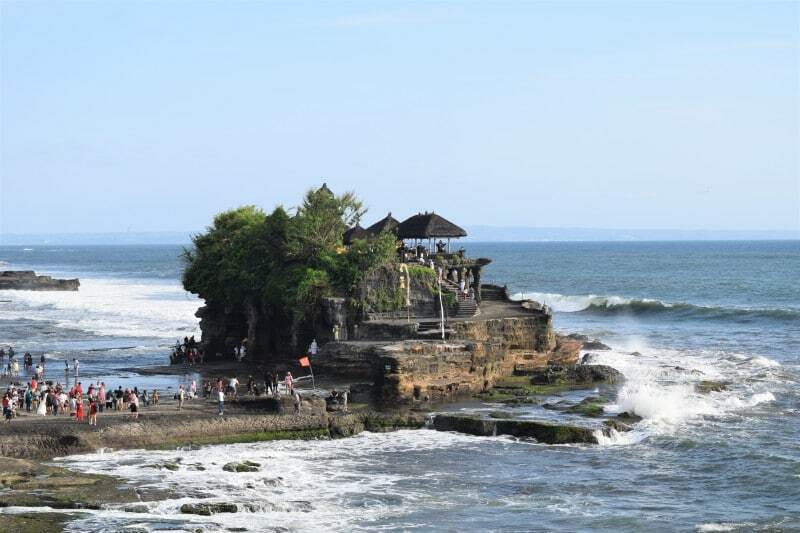 It helps me to plan the next vacation in Bali and balance the itinerary between Yorgykarta and Bali. I just have only 7 days in total, but I want to explore this region as much as possible.